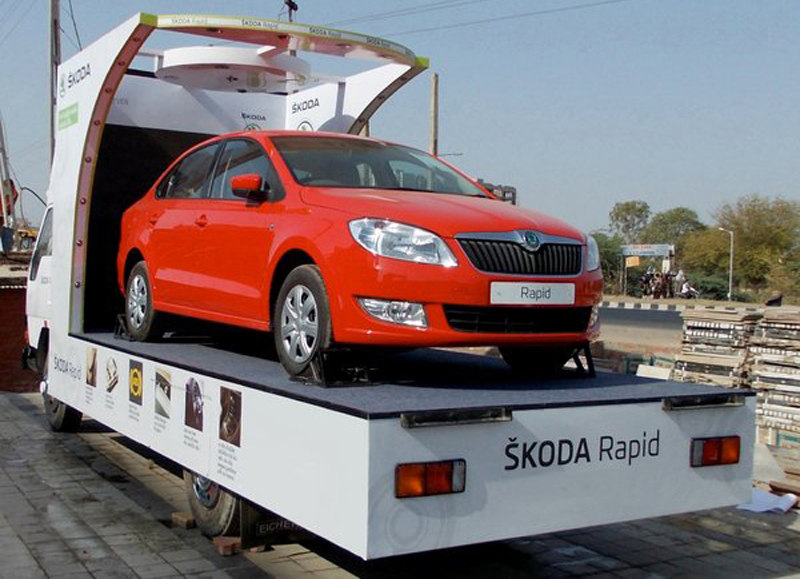 “Simply Clever” Campaign of Skoda seems to have got the response that the company wanted to garner and now Skoda Rapid Float Campaign has kicked off in Hyderabad which will throw light on the Simple Clever campaign. Skoda presently has a very strong market in India with Skoda Laura and Rapid doing well. It goes back a long time ever since Octavia and Superb were launched. The company has been in limelight since then and is revered well by luxury car makers. The foundation of the company was dug in Czech Republic and since then it has come a long way. Skoda, with the launch of Float Campaign aims to reach out to all those locations in Andhra Pradesh which are quite out-of-way and thus these are the locations where Skoda wants to roll Rapid out so that even those who are not accessible to showrooms in modern areas get a chance to drive Rapid. Mahavir Auto based in Hyderabad is taking care of the operations and the campaign has kicked off to a good start on June 9th, 2012.The whole campaign will take place in Andhra Pradesh and will take place across a span of 38 cities around Andhra Pradesh. It started with Vizag and then now it will be headed towards Vijayawada. The last stop will be Hyderabad. The whole tour has been extensively planned so that no important city in Andhra Pradesh is left behind. With the launch of Rapid in the automobile market in India, Skoda has garnered a massive response as the car has been given thumbs up owing to its design as well as ergonomics. The luxury offered by Skoda Rapid is top-notch and Skoda is planning upgrades on the car as well. Mr. Thomas Kuehl is presently the Brand Head of Skoda Auto India and is also the Director as well as member of the Board of Sales and Marketing division of the company. He was enthusiastic about the Float Campaign as he perceived that Skoda was keen on reaching out to the inaccessible areas in India where the car was not yet seen till date. Skoda will be showcasing Rapid on a flatbed truck across these cities from Vizag to Vijayawada to Hyderabad. There are primarily up-country towns where Skoda is taking the campaign and then this campaign will go on towards more small towns where the car at present in inaccessible. As for the campaign, there will be a team of representatives who will be part of the entourage and they will be giving all the intricate details of the car to the eager customers highlighting the features and specifications of Skoda Rapid. In case if a customer wishes to take a test ride, then that will also be made available to them. Skoda feels that this campaign will turn out to be highly successful as the graph of Rapid has always given a positive result of the sales all across all the states of India.